Hello poetry friends! Today’s prompt will serve double duty: I want to tempt you to write in one of my favorite forms, the ode, but also I want to create a sample poem on one of the themes for the Silicon Valley Reads Poetry Contest, sponsored by the Cupertino Library. Here goes! I love to teach odes, because kids get the idea quickly. We talk about Beethoven’s “Ode to Joy” which many of them have learned to play on their recorders if they are lucky enough to have music in school, and they readily understand praising and celebrating something or somebody. Read a couple of student odes at the CPitS website, in the Youth Poetry section. 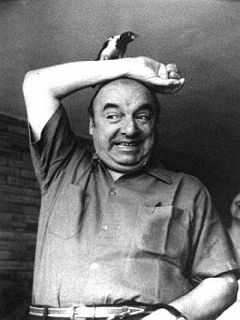 Pablo Neruda, one of my favorite poets, wrote many odes (collected in translation and the original Spanish) in Odes to Common Things, common things like onions and chairs. He’s great to teach, too, especially if you have kids in class whose first language is Spanish. Neruda’s odes help dispel the silly idea some of us picked up in English Lit class that odes have to be about urns and dead athletes and other things we don’t care much about anymore. This one, “Ode to a Large Tuna in the Market” will give you a flavor. My poem (which I’ll publish in a separate post) is also an example of how you can hyperlink images, music, and other information to your poem, if you want to experiment. One of the prompts for the Silicon Valley Reads poetry contest is to “write a poem using technology as part of the process. Use hyperlinks, video, photos or music as part of the poem’s form.” This poem of mine, “Ode to An Oddball Winter” is just such a conglomerate mishmash kind of poem.